So in 2017, I went with my family to Sardinia. It was AMAZING! We had a flight in the early morning. I’m always very excited when I’m on a plane. This time was no different. So we stayed a whole week there. We had hired a big ‘villa’ or something. It was a really big, nice house with a stunning view! From one of the windows, you could clearly see the sea. So the first day, it was very windy. First, we didn’t want to leave the house, but after a while, we went to the bay. It was way too windy to swim, but it was fun! We took a lot of pictures, and we explored the surroundings. This is me, sitting on a big rock when the wave hit it. I didn’t get wet the first time, but when my sister also wanted a picture like this, I waited for her behind a big rock. When the wave hit, I was soaked! The second day, it was less windy. We went to Sassari. It is a big city, but when we were there, it was very quiet. It seemed like we were the only tourists there. At Lunchtime, we were searching for a restaurant to eat. Well, that was very difficult. I’m a vegetarian, so either the food wasn’t vegetarian, either the restaurant was closed. In the end, we found a restaurant and the food was amazing! The third day we swam in the bay and stayed in the house. After a whole day of sightseeing, we wanted to rest. We played board games, read books and swam. As you can see, it was still (a little) windy. It was very nice to swim here! It was still windy (right corner). Especially after the first day, when the wind was wild! It was a nice bay, but on the fifth day, we found a much better bay. The fourth day is my favorite day! 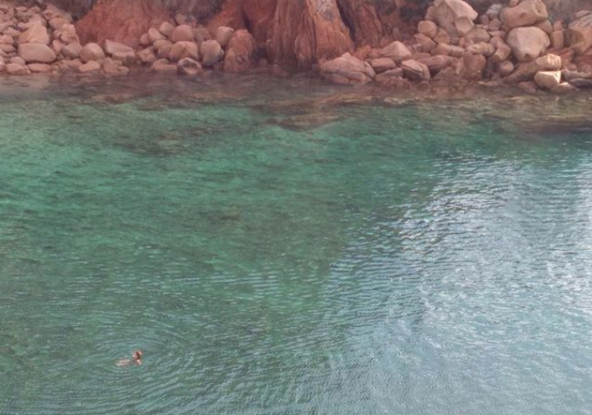 We went to islands above Sardinia. The islands are called Maddalena. We drove like two hours and then we took the ferry to the island itself. Once there, we drove for a while to see a bit of the island. We then parked the car and walked around the island. I remember eating at a really nice restaurant. In the afternoon, we searched like an hour and a half for a really nice beach. When we found the beach, I immediately jumped in. It was like a paradise! Then my brother called me from the beach that he found a much more amazing beach, hidden behind bushes and trees. I was like: MORE amazing? Is that even possible? Well, it was! First, we were on a little beach with a few other people. Then we had a private beach. I mean: PRIVATE!!! There was literally no one, except us. Also, the beach was even more beautiful! The colour of the water was light blue, and it was tropical! The first beach. All the black spots are seaweed. Very gross to step on! The second beach: like a bounty island! We stayed here for several hours and had a lot of fun. Then it was late, we had to go home. We first got ice cream. Very important of course! The fifth day we explored the neighborhood. We heard from a few locals that there was a really nice beach. It was a ten-minute walk from our house. We had to walk along the mountainside on narrow paths. The colour of the water was greenish, and the atmosphere was really nice! We also swam a lot in the pool. The next day we went home. It was AMAZING and I love looking back. Please leave a comment! Did you like it?